The most recent trade was sold for a loss. I don’t mind selling stocks at a loss. This was my biggest loser so the job was easy. I simply cut my losses and by doing so kept them small. I’ve had my share of bad decisions in my trading career and keeping losses small in order to avoid huge losses is the toughest part. Why is that so? From a psychological point of view, nobody wants to sell at a loss as in most situations in life making mistakes and admitting them is associated with being a loser. 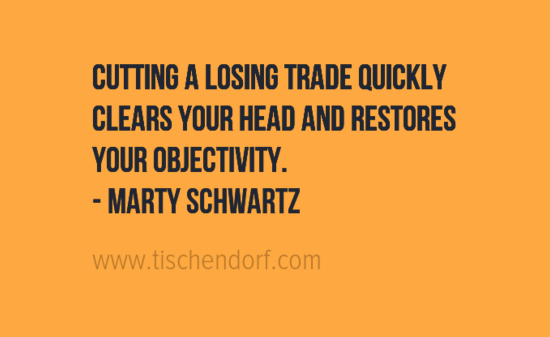 That’s why most people prefer sticking to a losing position. They don’t want to be labeled a loser. They start hoping their position will turn around and end up being a huge winner. The stock then keeps tanking. Then they hope they will be able to sell for a break even. The stock then goes down even more. That’s when being objective and balanced isn’t possible anymore. Losses have become huge and they are trapped. The cost is simply huge. You lost money. You lost time. There’s also an Opportunity Cost as during that time other stocks could have made you a profit. You lost huge amounts of Mental Capital as you couldn’t get this stock out of your mind. Notice I’ve made ample use of the word ‘huge’. 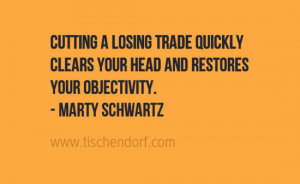 Avoid huge losses at all cost. Avoid thinking in terms of huge gains as well. Stay balanced. Stay focused and calm!